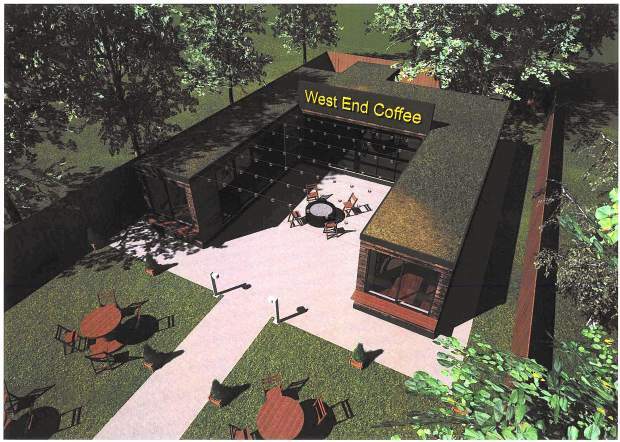 Plans for West End Coffee and Tap, at the west end of Donner Lake, are coming to fruition with the Truckee Planning Commission’s approval of the project. The required number of parking spots on the property as well as noise levels and the impact on surrounding neighbors has held the project up, pushing it through three public hearings. The approval requires the project to include nine parking spaces, a number which Mollie Hagar, who proposed the project along with her husband Bjorn Anderson, had said in the past they would be unable to meet due to the limited amount of space on the property. To move the project forward the owners will be permitted to find additional spaces off site, keeping at least five parking spots on the property. One option includes utilizing the public lot operated by Tahoe Donner Recreation and Park District that sits across the street from the project site. The coffee shop and tap house was proposed in June by Hagar and Anderson. The two had been working with the planning department for months to find common ground on the required number of parking spaces. Originally the site had called for 13 parking spots. The town hired LSC transportation to conduct a study on the parking requirements, which Assistant Planner Laura Dabe said is uncommon for such small projects. The study determined that the number of spots could be brought down to 10, which the commission then lowered to nine spots. “The site design of five parking spots was extensively researched and extremely well thought out,” said Hagar, noting they had considered accommodating nine spots. Hagar said with such a small site there has to be a balance between the building’s patron space, the parking demand and the snow storage in the winter. “As a business operating in the mountains, indoor patron space is critical to operating a successful year-round business,” she said, emphasizing that they were incapable of changing the building design to accommodate for more parking spaces. “I really do like the project; it is a good amenity to the neighborhood. I think it is a very difficult site,” said Commissioner Seth Kielas. An additional concern the commission had was the closing time of the business and how noise generated from the outdoor seating would affect neighbors. After deliberating over the issue with Hagar, and hearing comments from neighbors, the commission determined that the tap house should close their outdoor seating at 8 p.m. and the inside at 10 p.m.
“The way I feel we have struck a reasonable balance. We’ve listened to the neighbors multiple times we’ve read all the comments,” said Kielas, adding that it may not be what Hagar would want.